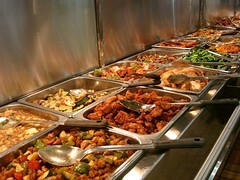 I am not a big fan of Buffets by the pound- for obvious reasons. Or maybe it’s not so obvious if you are skinny and have any amount of self control. Me, not so much. I love the “buffet” part, but adding those other three words, destroys what is otherwise a wonderful, magical thing. First, I don’t want to know how many pounds of food I’m about to eat (Is it true if you eat 2 lbs of chinese food, you automatically gain two pounds?). Second, I feel hindered. I’m thinking, “Gee what does this weigh?” and “Am I really getting a good weight to price ratio”. Always trying to find that big money item and staying away from super heavy cheapo items like rice, and dumplings (my personal favorite). Well, I’m happy to say I have finally found a price by the pound buffet that is not only a decent value- but is stocked with my favorite kind of food! 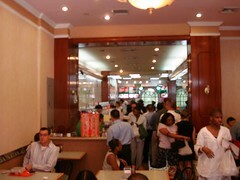 Ho Yip, a cheap chinese food place on 45th between btw. 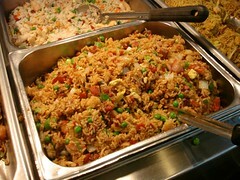 5th & 6th that during lunch has an all chinese buffet by the pound (and the choices are tremendous!). It’s $4.95 per pound- but here’s the real deal. If you go after 2:15pm, the price drops to $3.75 a pound (the late lunch special). Now, I know what you’re thinking. “Late lunch” and “Price drop” at a buffet by the pound does not exactly instill confidence in the freshness of the food you’re getting. But I was very surprised to learn that they restock the buffet just before 2:15 in preparation for the big crowds that come late looking for the deal. Apparently they keep putting food out until they run out. It really is a wonderful thing… if you like cheap and greasy Chinese food (and don’t mind waiting with a horde of other bargain hunters). At $3.75 a pound I am freed from that nagging voice inside me saying “Small scoops” “Big money items” and ”Stop piling on the rice”. For once I could actually enjoy a buffet by the pound. I started with the pork fried rice (big chunks of pork, looked really good), then quickly moved on to the beef chow fun (something you don’t see as a buffet option very often- but very welcome). A Scallion pancake and **two** different kinds of dumplings followed (one pork, one chicken). Very exciting. As you can see it’s a jumbled mess… which is one of the problems with these places. If you’re like me, and like trying everything- it’s tough to keep things separated, and in the end, it ends up being a (delicious) disaster. Oh well… such is life. 1.47 lbs, total cost at 2:14 pm $7.28. Two minutes later that price drops to an astounding $5.51!!!! Now, here’s the downside. Nothing was really great. Most of the things I ate were either a little too sweet (the Thailand chicken… or maybe the General Tso’s. Couldn’t really tell… everything blended together), or a little too salty (the eggplant and squid). The dumplings and scallion pie were good (because they’re fried… and anything fried is good)- but everything was super greasy. Of course that’s to be expected with most cheap Chinese food… but there is a saving grace. A giant serve yourself FREE carafe of black tea. Take advantage… it makes you feel a lot better after 1 1/2 pounds of greasy chinese food. For those who are still against the buffet by the pound concept, they have a counter in the back with regular lunch options… and some of their specials were very authentic and looked surprisingly good. Bitter Melon with Beef or Fish, Oxtail Stew with Potato, House pork chops or Chayote (a type of squash) with sliced pork. The best part is, if you have never had any of these more traditional dishes, but have always wanted to try them- they’re in a steam plate, so you can see them before you order. 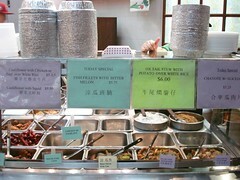 Really great selection with some items you don’t normally find at buffets like this. If you prefer variety over quality, this is your place. More traditional dishes in the back. Specials change every day. Super greasy. Super salty. Super Sweet. 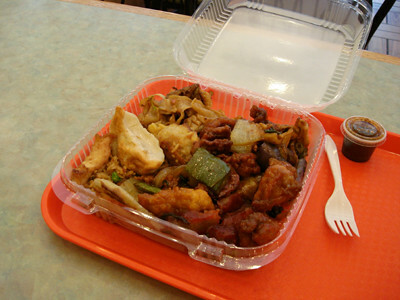 If you prefer quality over variety, there are better places for cheap Chinese food. Not enough seating. Fills up very quick at all lunch times. Be prepared to share a table with a stranger, or take your food to go. Now if only this place was all you can eat… it would be heaven. Posted by Zach at 12:42 pm, August 10th, 2006 under 45th btw. 5+6th, Blogroll, Buffet by lb., Ho Yip/Sun Yip. but it is great food normally. It’s proof that you can do food in NY without breaking the bank. There are a lot of people who tell me that I can’t eat cheaply when I go home to visit. I tell them they just have to know where to look. I too enjoyed the great lunch deal a few times, that is, until i found a small piece of metal inside the orange chicken. No joke. So just a fair warning to those that try this place. I never went back. I can’t find this place anywhere. What’s it’s address? Just tried the after 2:15 special for the first time. 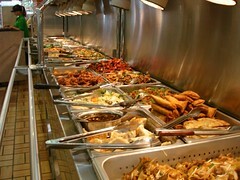 I went around the buffet, picking up very, very tiny portions of everything that looked good. Just a bite or two per item. Total bill was about $1.50. Then I sampled my collection of nibblers, went back to the buffet a second time, and this time focused like a laser on only the good stuff. Second bill was just over $3. Total amount of food (and $$) wasted due to items I didn’t like: pennies. I found 2 pieces of glass in my lunch from this place, and I reported them to DOH for it. It’s a shame because the food tastes great, but not at the risk of my intestines getting shredded.